Me voici de retour sur le blog, après une semaine de l'autre côté de l'atlantique. J'ai essayé de rester raisonnable niveaux shopping, d'ailleurs je crois que ce que j'ai acheté, du moins quelques pièces sont disponibles en France, mais bon c'était pour marquer le coup ! Cela faisait plusieurs mois que l'idée de me percer l'oreille me trottait en tête... J'ai décidé de me le faire un jour avant mon départ, (en réalité 2 car mon vol a été annulé) j'avais repéré le matin même le studio Venus by Maria Tash, je vous le conseille si vous souhaitez vous faire un piercing ou un tatouage ! Un joli cadeau d'anniversaire et de quoi me souvenir de ce voyage ! 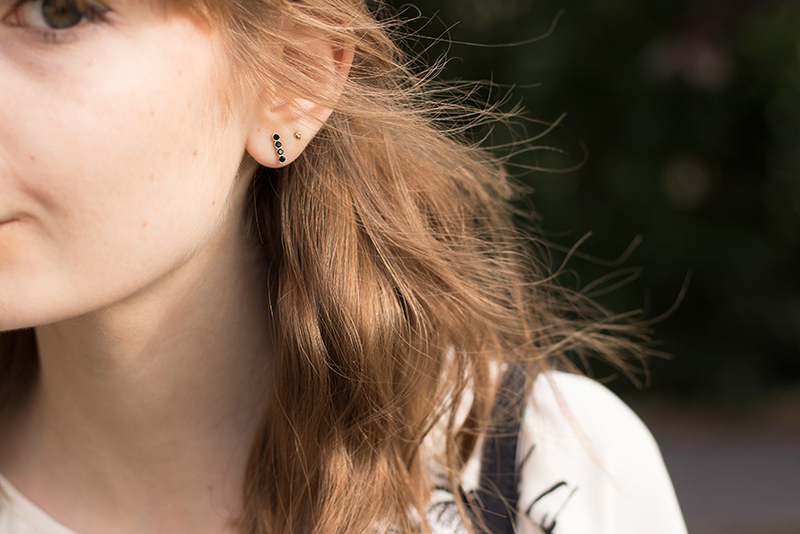 It had been several months that the idea to pierce my ear kept running through my head ... I decided to make it one day before I left, (actually 2 because my flight was canceled) I did some research the morning and I found the studio Venus by Maria Tash, I really recommend you to go here if you want to get a piercing or a tattoo! A nice birthday present and what to remember this trip! I'm back on the blog after one week on the other side of Atlantic. I tried to be reasonable with the shopping, and I think what I bought, at least some pieces are available in France, but I have to buy something in NY ! I bought this little top with H & M, I loved the palm print. Although, I've found the same, bare shoulders. I matched it with my faux-leather short, (who was still wearing his tag ... you must know me) and my shoelaces sandals.